You are currently browsing the archive for the Activism category. 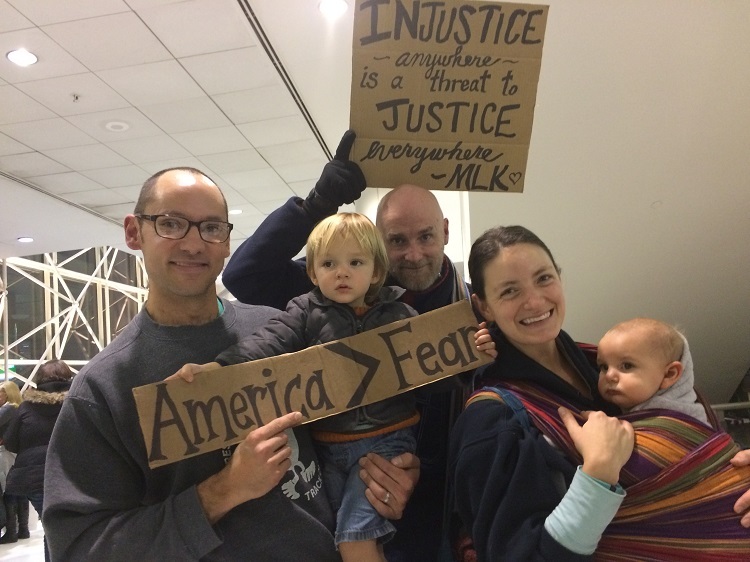 Jonah House core community was happy to spend time with 2000 other good folks at Thurgood Marshall/BWI airport outside Baltimore, on Sunday January 29, 2017, protesting President Trump’s ban on Muslims, and in support of those who had been detained and finally released. We think Thurgood Marshall, watching the scene from that great cloud of witnesses, heartily approved this outpouring for tolerance and compassion. 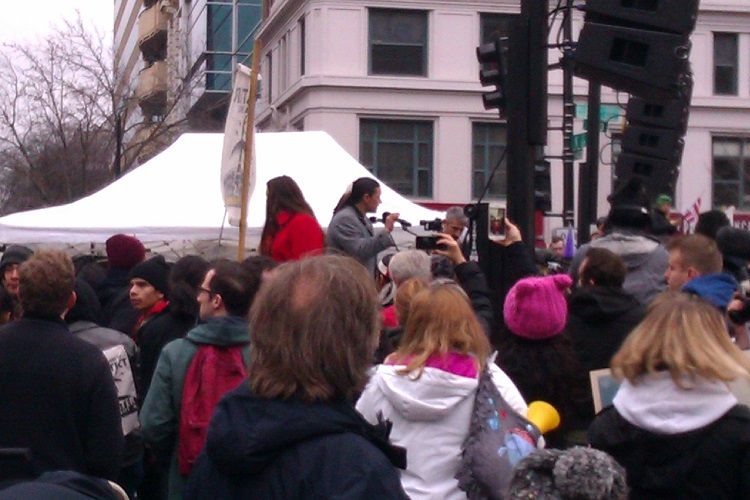 Thanks to Franny Lerner for taking the pic and sending it to us. 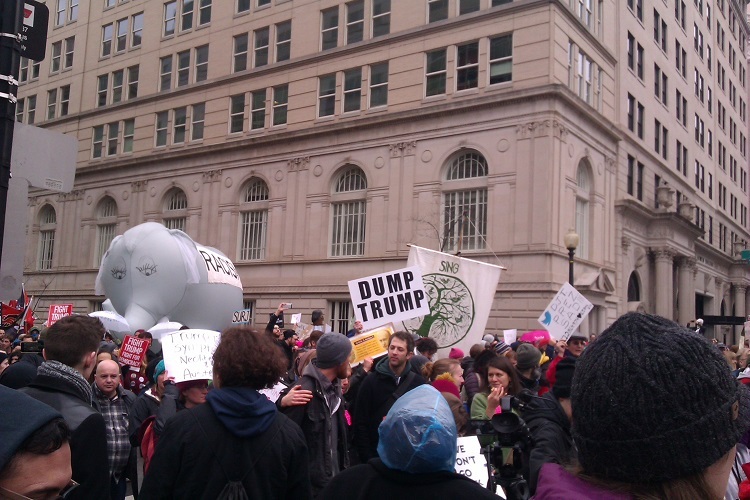 On January 20, I was one of thousands who came to Washington DC to inaugurate the resistance to Donald Trump! 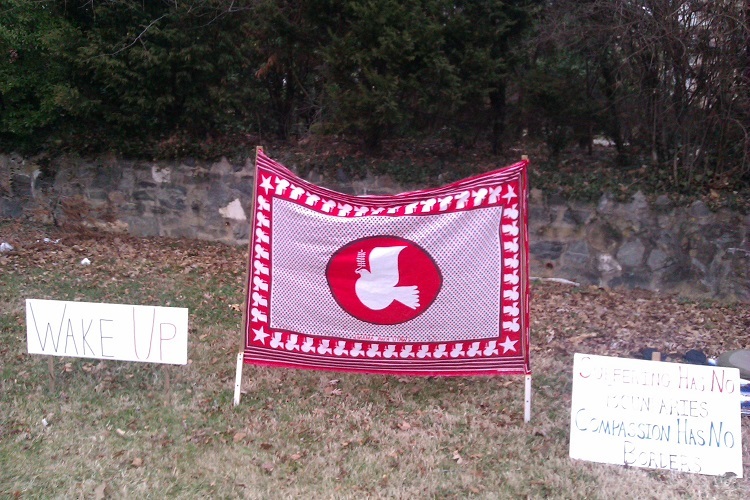 I started off at the metro stop in Takoma Park. 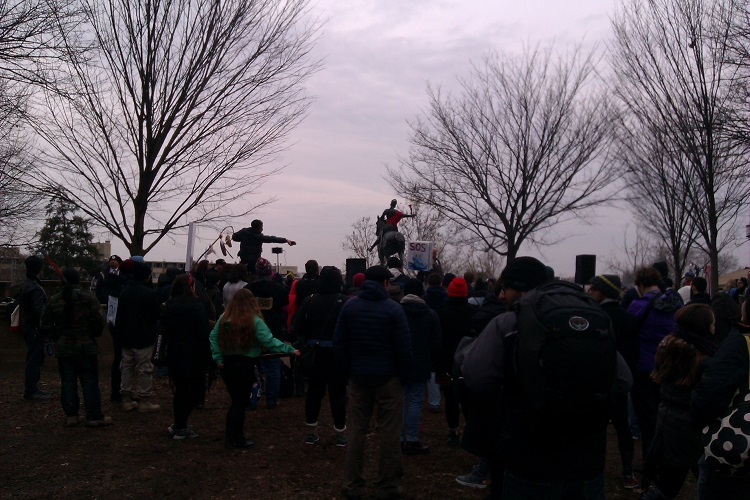 I got off the metro at Columbia Heights, strapped on my marching drum, donned my signs, and walked down to Malcolm X Park where the ANSWER rally was already in progress. 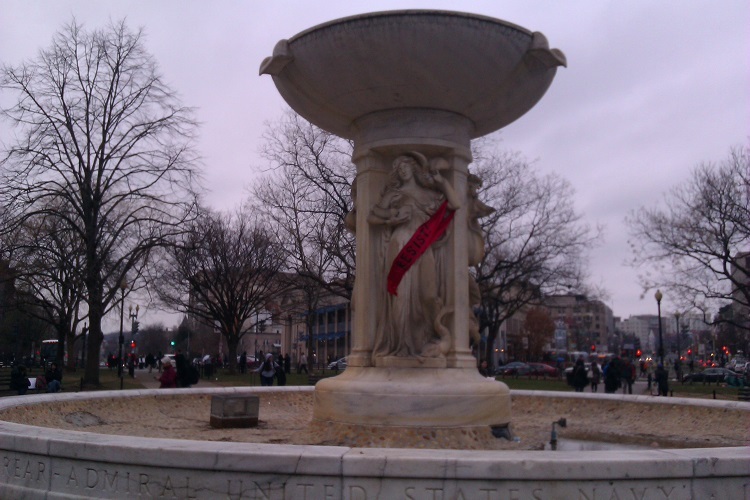 As I was walking towards the rally, I saw the statue of Joan of Arc and thought wouldn’t it be nice if her sword were replaced with a flower. As I got closer I saw that that’s exactly what someone had done (I believe Joan lost her sword some time ago). There was Joan clutching a red carnation. 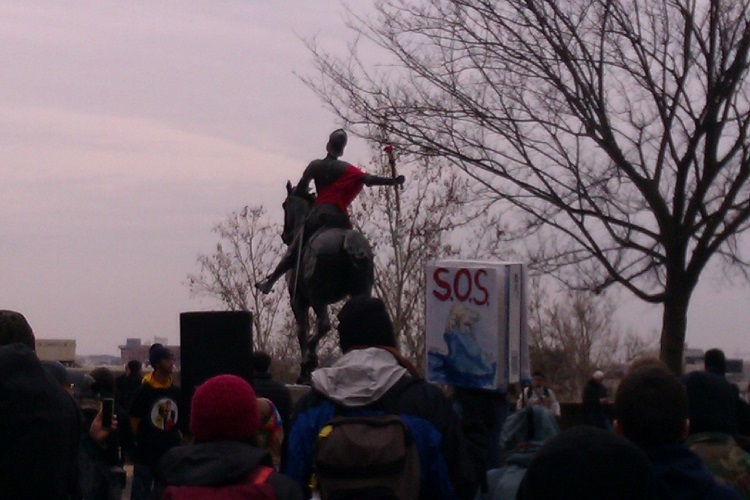 She was also wearing a revolutionary red sash. The crowd was sparse but spirited. 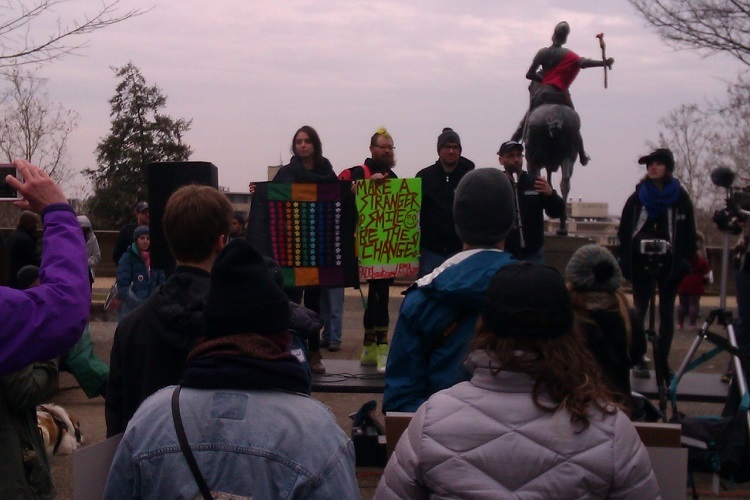 There were some inspired speakers, including folks from the Equality Coalition, a radical LGBTQIA group. 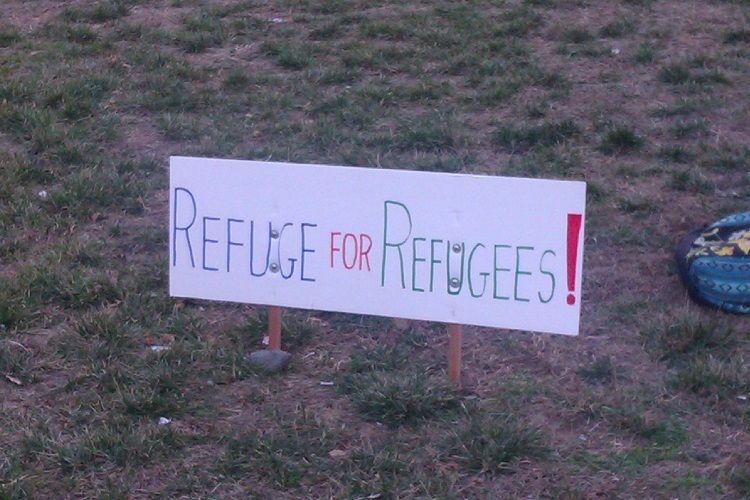 There were a lot of good signs. I like the one above: “Make a stranger smile. 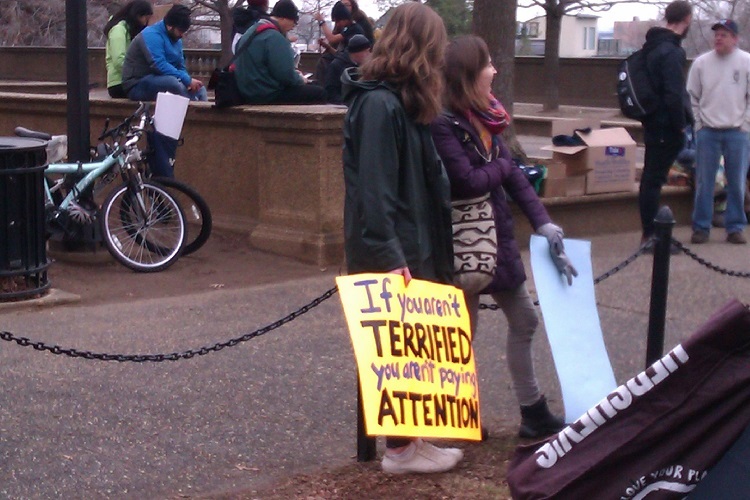 Be the change.” And this one: “If you aren’t terrified, you’re not paying attention.” I guess this is a variant of the more common “If you’re not outraged, you’re not paying attention.” Actually, with Trump at the helm, you don’t have to pay much attention to be outraged. Everything he does, every word he speaks, is outrageous. I didn’t stay for the whole rally. I wanted to get to Columbus Circle (in front of Union Station) for the DisruptJ20 march (the ANSWER folks would be marching from Malcolm X Park to join the DisruptJ20 march at McPherson Square). 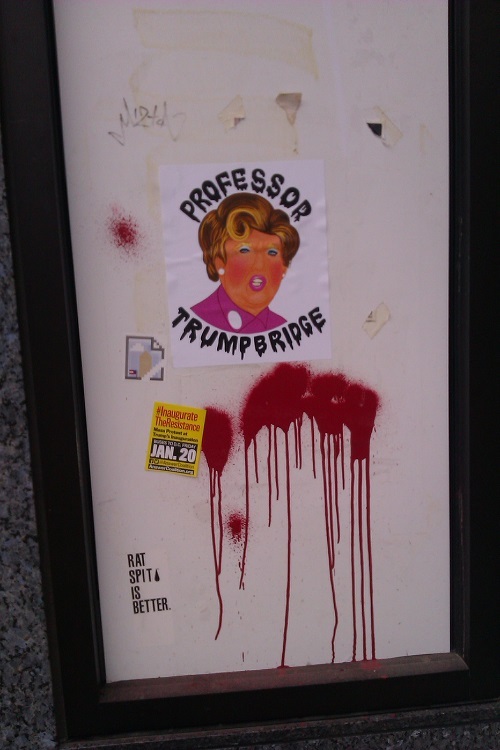 I’m not sure who Professor (Something)bridge is. Is this supposed to be Dame Edna Everage (the hair style is similar, but Dame Edna’s hair is usually purple)? It also looks a bit like the Iron Maiden, Maggie Thatcher. 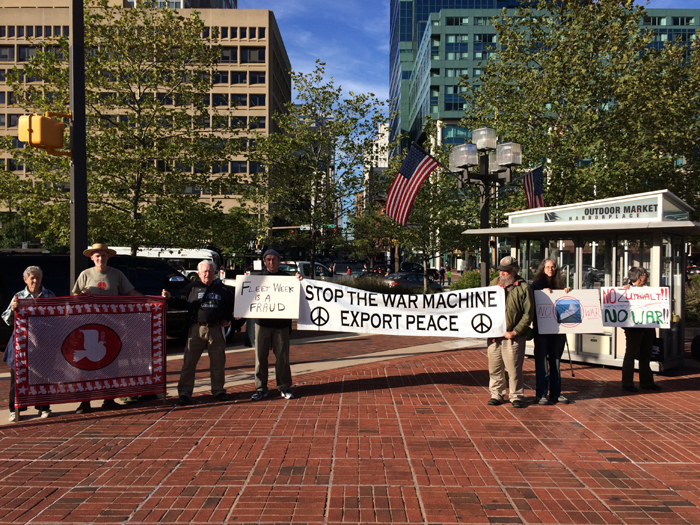 I took the metro to Gallery Place and walked to Union Station, wearing my signs (the sign I had on my back said “Swords into Plowshares”). This is what I saw when I got to the march at Columbus Circle: the water protectors from Standing Rock leading the march. 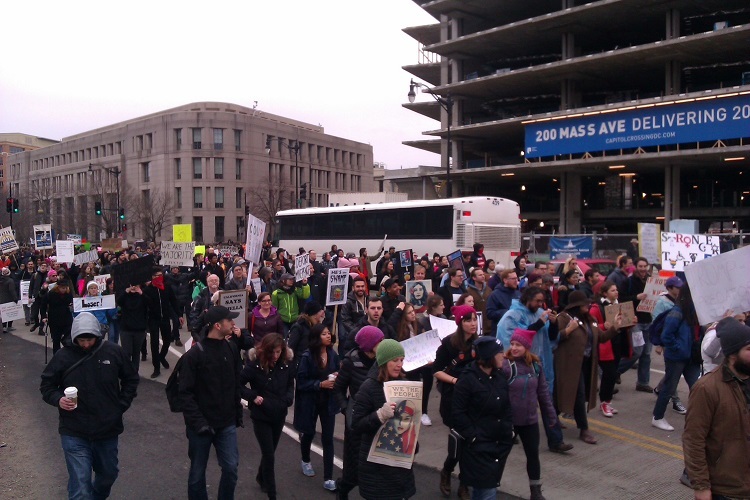 The march was just getting underway. I joined in. 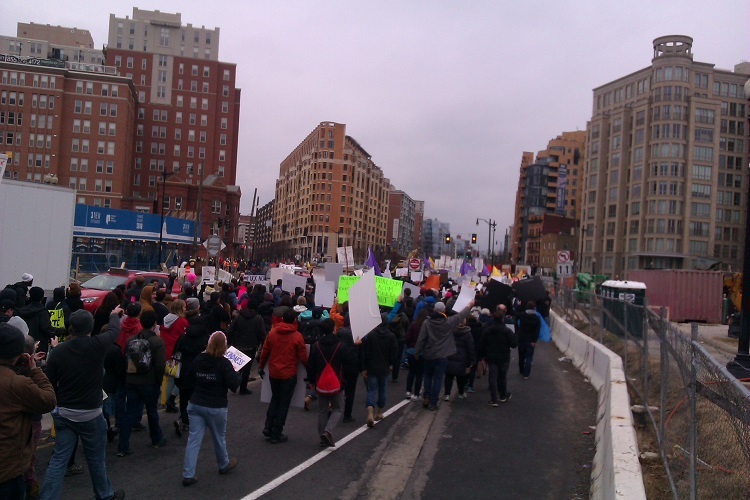 We marched for quite a while, walking parallel to the inaugural parade route. I found some other drummers and drummed along on my darbuka (metal drum from Turkey). 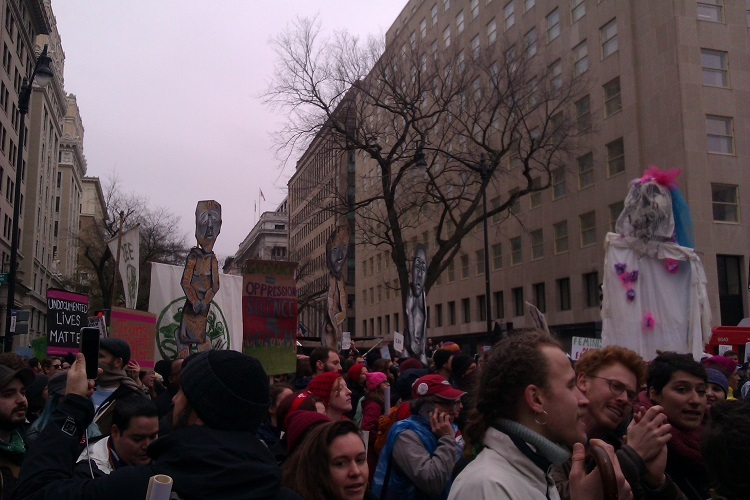 The march ended at McPherson Square, a few blocks from Peace Park (Lafayette Park) and the White House. 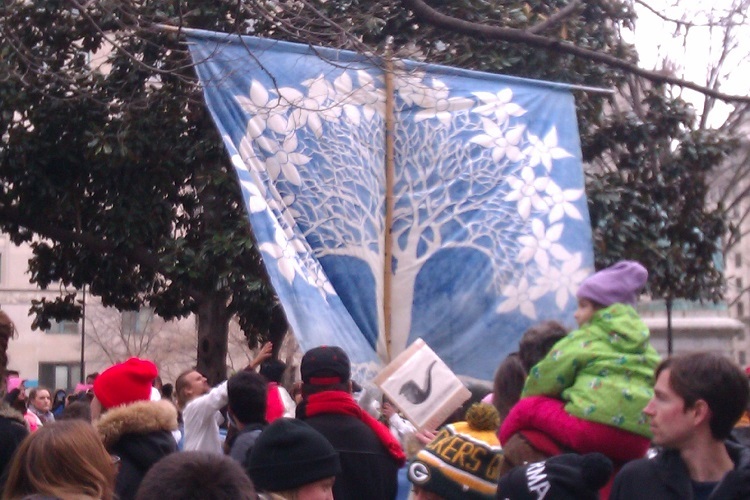 I waited for the Bread and Puppet figures to arrive at the park. 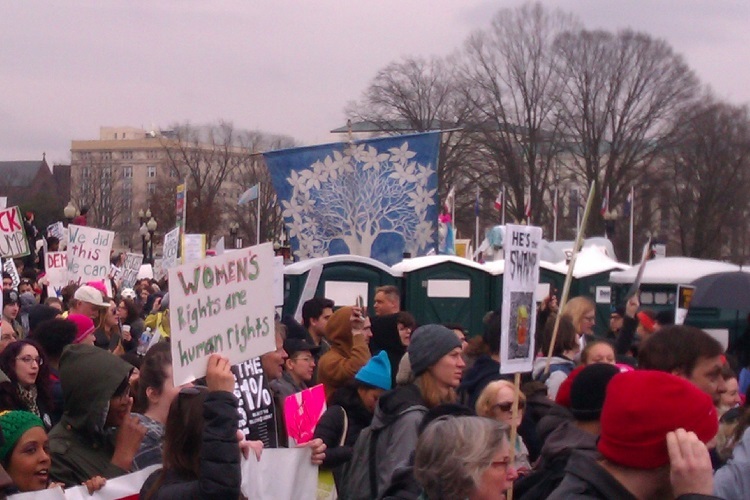 It’s not a march if they’re not there! 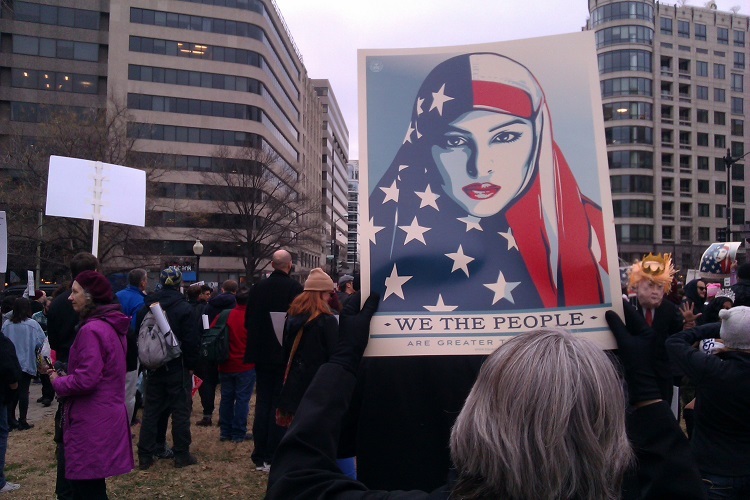 There was a festival atmosphere at McPherson Square (where a few hours earlier the police had been shooting rubber bullets and tear gas at protesters). 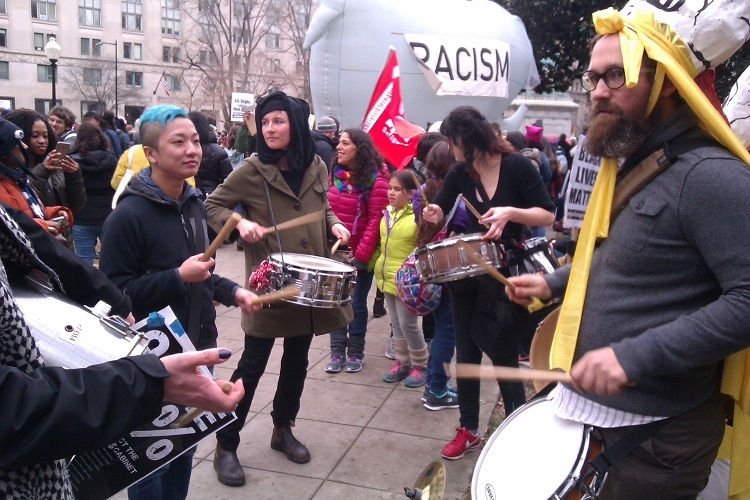 I found a ragtag drummer group and joined in with my drum. 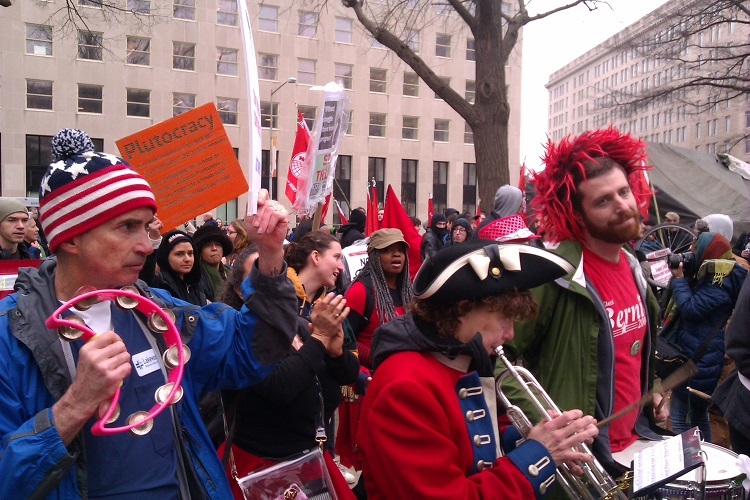 Then the drummers were joined by a ragtag marching band. I pulled out my kazoo and played that, along with my drum. 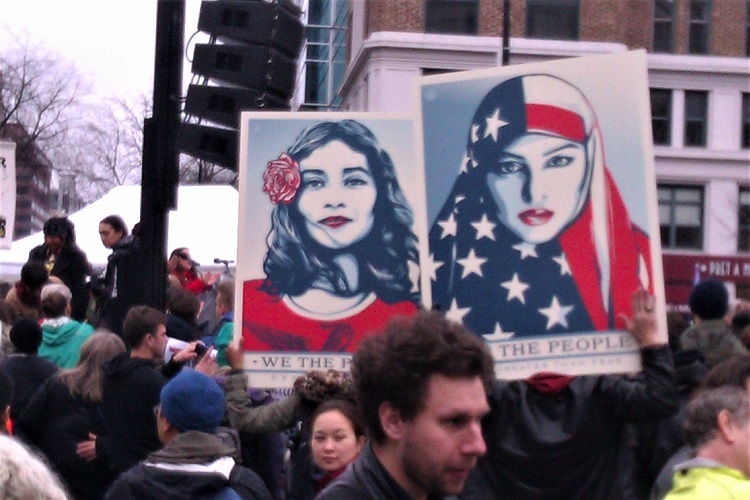 I thought this punning poster, based on Shepard Fairey’s famous Obama “Hope” poster, was clever. 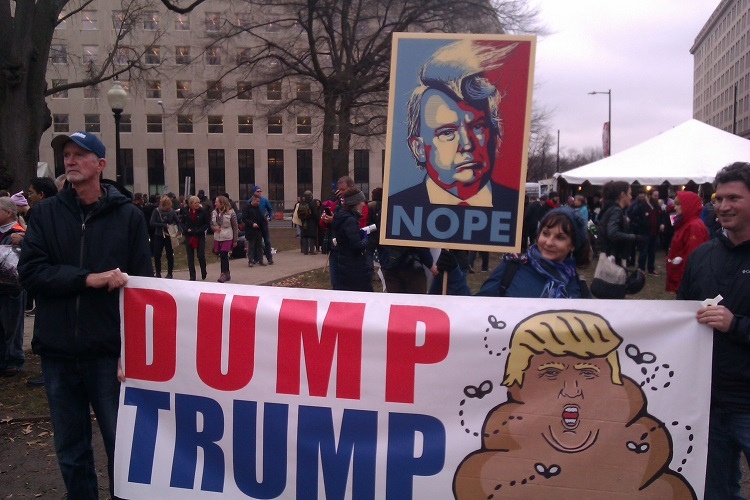 The “Dump Trump” banner was less clever, but certainly colorful! There was at least one more. You can see all three here. 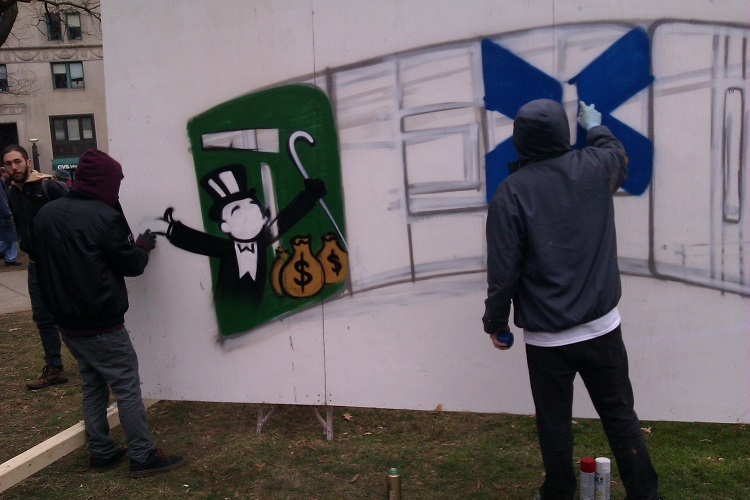 There were graffiti artists hard at work when we arrived at McPherson Square. I didn’t stay to watch them finish. His message was basically this: We’re all in this together. It’s time to resist because Trump and his minions will try to take it all, and trample everything we’re worked for. Stand up and resist! 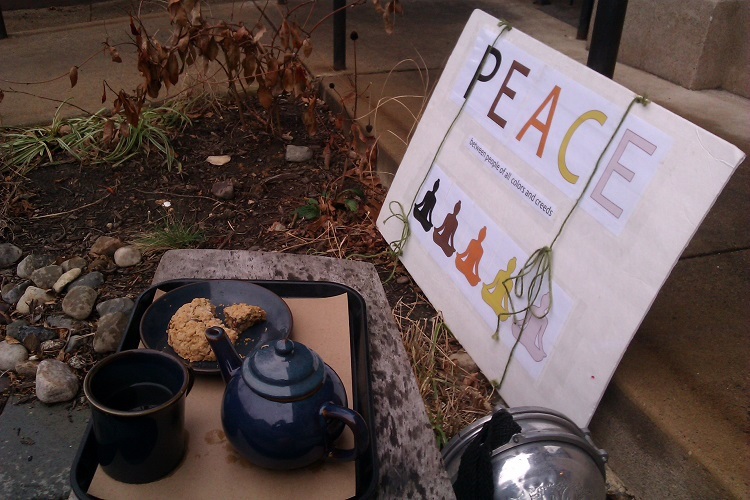 I ended my march at one of my favorite haunts at Dupont Circle: Teaism. The place was crowded so I drank my tea outside. 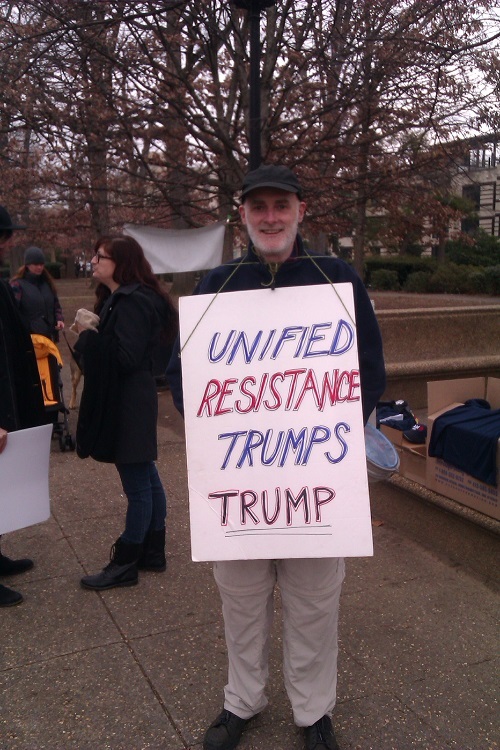 You can see my darbuka, and the backside of my “Unified Resistance Trumps Trump” sign, which reads “PEACE between people of all colors and creeds”. The tea I drank was called “World Peace.” When I ordered it the guy behind the counter said: “That’s what we need. 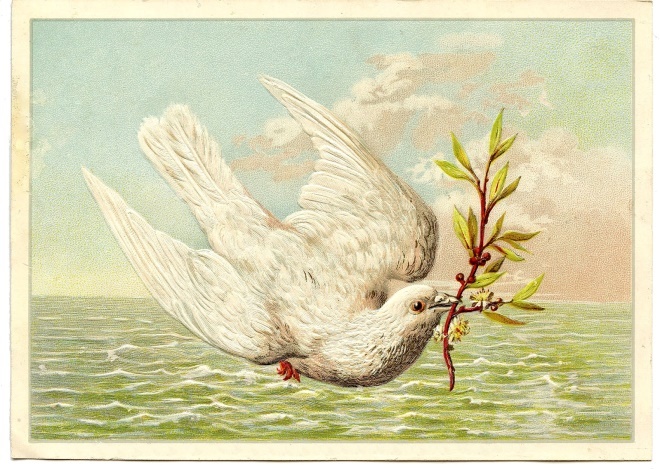 World Peace.” I replied, “Yes, we certainly do.” And I hope to do my part in the next four years, at least. The Martin Luther King Jr. who is cynically trotted out every time racial unrest erupts in our cities is the MLK who can be conveniently used to prop up the status quo. He is MLK reduced to “I Have A Dream,” used in conservative political ads  to scare-monger about invading, job-stealing Mexican immigrants. He is the almost wholly fabricated MLK whom the modern GOP claims would today be one of their own , presumably standing alongside them as they vote against the poor, people of color and women of every race at every opportunity. In reality, those examples rely on half-truths and half-reveals of who MLK truly was. In real, big-picture life, MLK was far more radical than the cherry-picked lines from his speeches and books would suggest, a man who moved further left over the course of his long and weary fight for African-American civil rights. By 1966, MLK had become an outspoken opponent of “liberal” white complicity in white supremacy, of American imperialism and warmongering, of the capitalist system itself. Modern right-wingers’ use of quotes from MLK (here are a few examples ) to twist and misuse his words in ways that belie much of what he ultimately came to stand for. 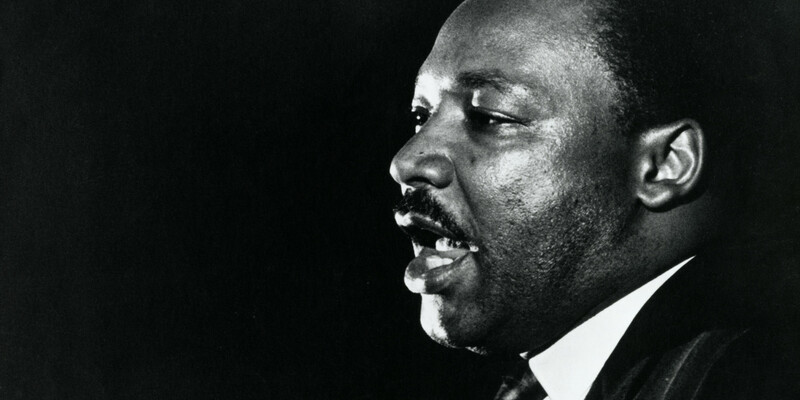 The next time you see MLK corrupted and misused as a tool of capitalism, racism, unchecked white supremacy, and war, recall that MLK said “a riot is the language of the unheard.” Here are several more examples of MLK’s most radical statements. 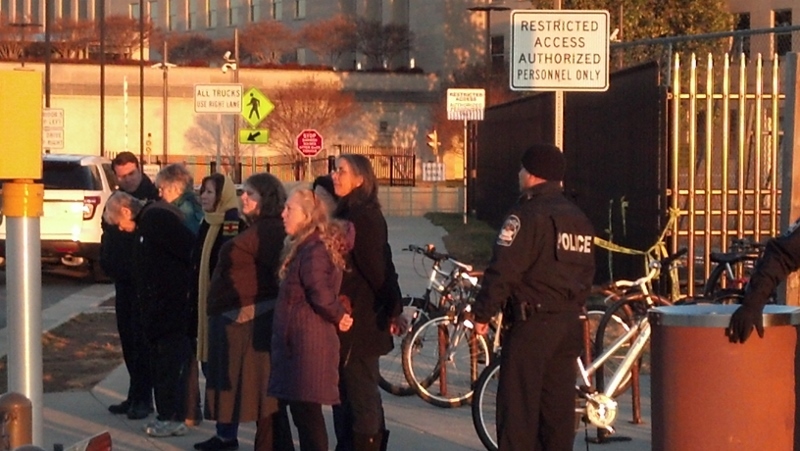 Joe, Ardeth and Carol were able to participate in the recent Holy Innocents witness at the Pentagon. Joe helped out with the singing, while Ardeth and Carol got themselves arrested for the sake of peace, and for the children who are so often the victims of war. This year’s witness was a special commemoration of Fr. Dan Berrigan, SJ, who died this past April 30. 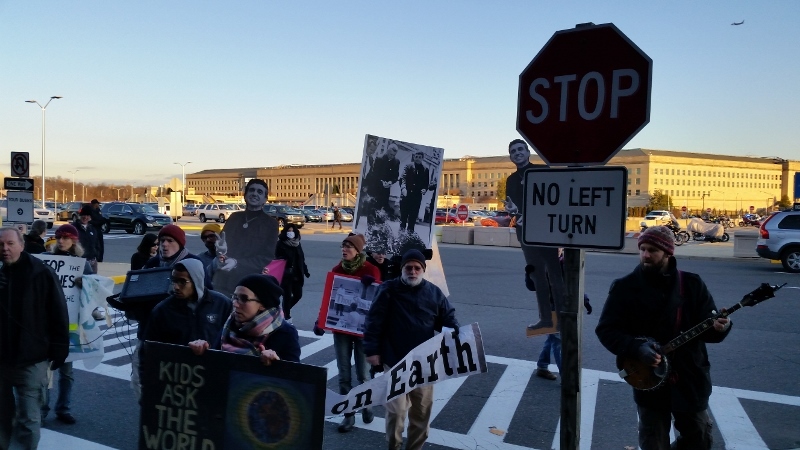 There were many bigger-than-life-size Dan Berrigan cut-outs carried to the Pentagon. Quite of few of them got arrested! Photos care of Lin Romano. 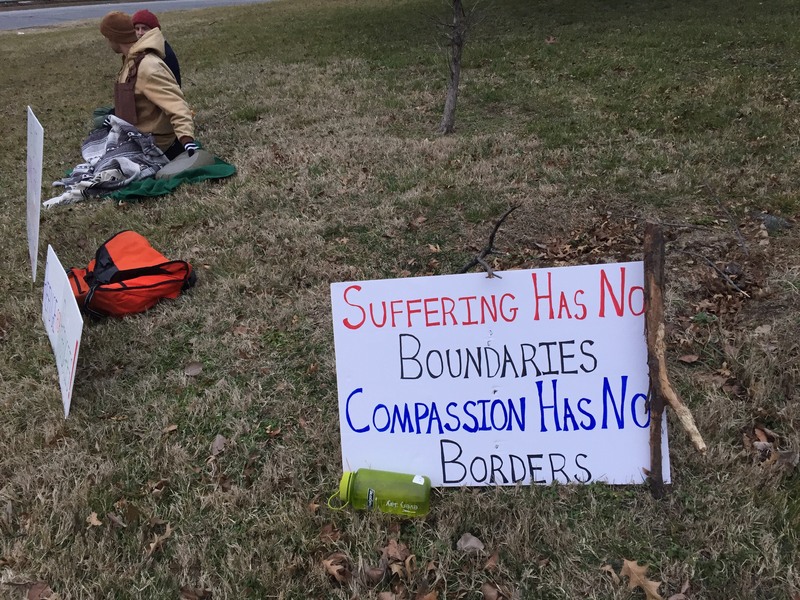 Here Ardeth and Carol, and others, have taken the hill overlooking the Metro entrance to the Pentagon. It’s 7am – dawn on December 28. 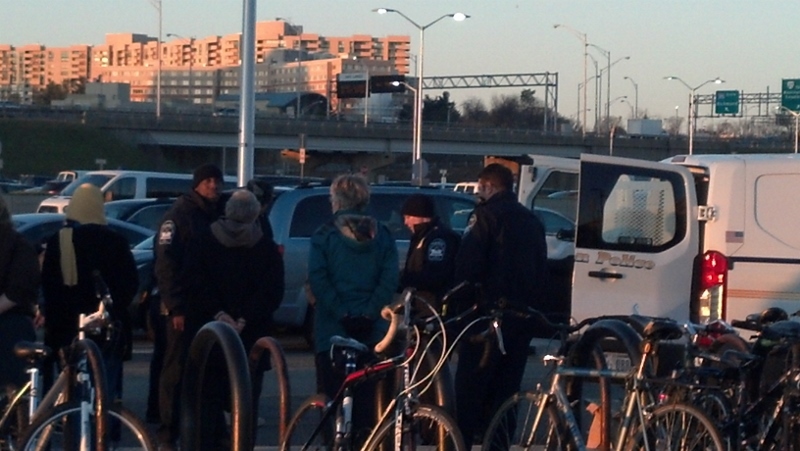 The sisterhood of protesters are cuffed and wait to be taken away. From behind you can see Ardeth and Carol waiting to be loaded onto the police van. 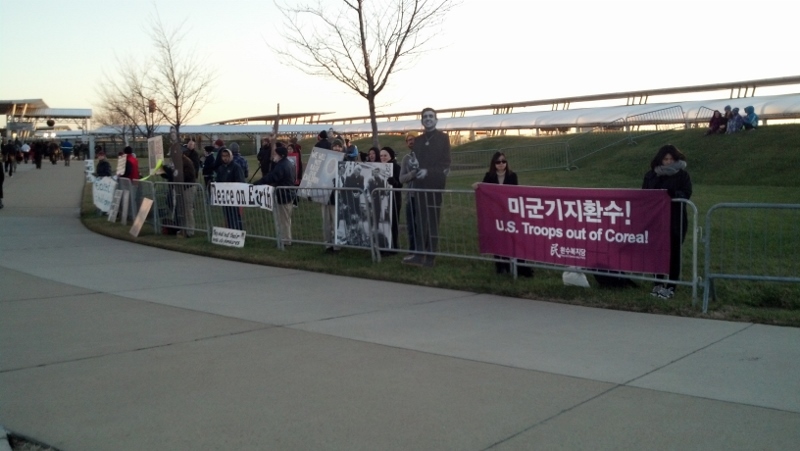 Here are folks in the supposed free speech pen, including some friends visiting from South Korea. 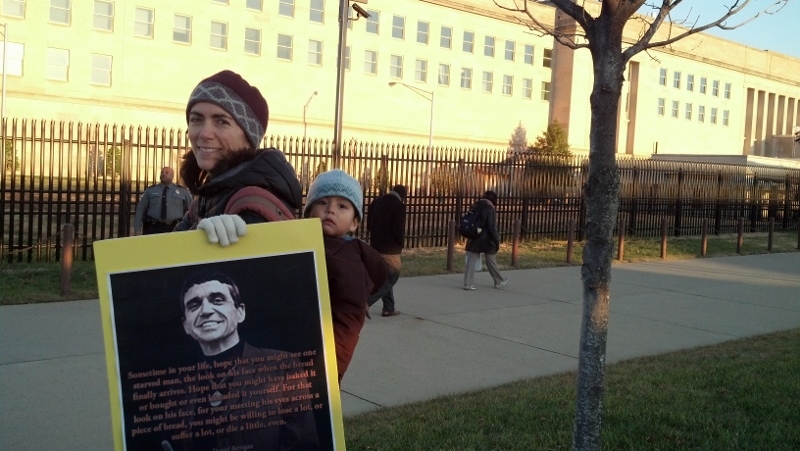 Madonna and child (and “Uncle” Dan) at the Pentagon. 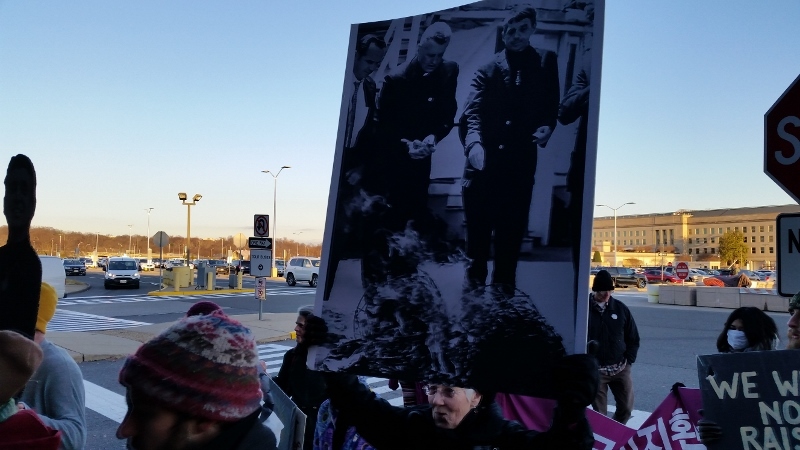 Here is a poster showing the famous picture from the witness of Dan and Phil Berrigan as part of the Catonsville 9 in 1968. 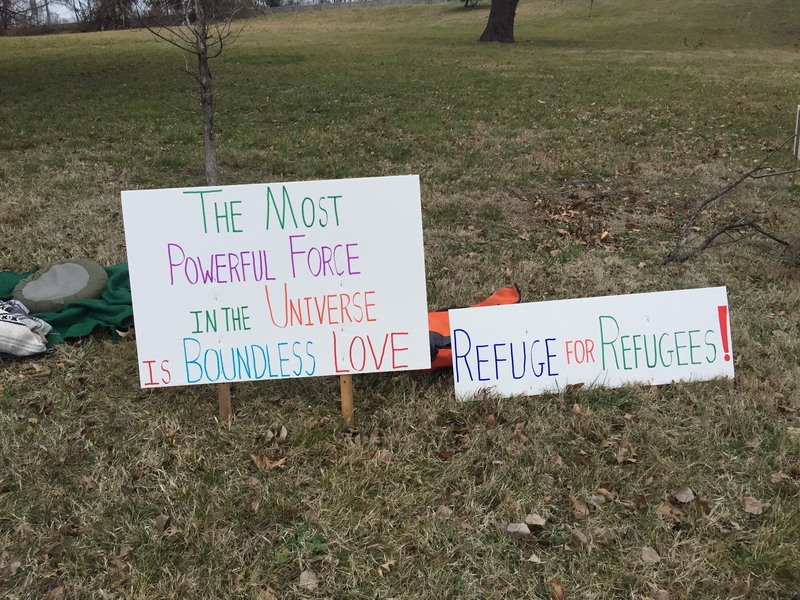 Those not arrested leave the Pentagon. Joe holds the speaker and helps lead song. Note: This message on nonviolence by Pope Francis was issued on New Year’s Day, the World Day of Peace. Sr. Carol shared it with us at our Sunday liturgy on New Year’s Day. Now we share it with you. To be true followers of Jesus today also includes embracing his teaching about nonviolence. As my predecessor Benedict XVI observed, that teaching “is realistic because it takes into account that in the world there is too much violence, too much injustice, and therefore that this situation cannot be overcome except by countering it with more love, with more goodness. This ‘more’comes from God”. He went on to stress that: “For Christians, nonviolence is not merely tactical behaviour but a person’s way of being, the attitude of one who is so convinced of God’s love and power that he or she is not afraid to tackle evil with the weapons of love and truth alone. Love of one’s enemy constitutes the nucleus of the ‘Christian revolution’”. The Gospel command to love your enemies (cf. Lk 6:27) “is rightly considered the magna carta of Christian nonviolence. It does not consist in succumbing to evil…, but in responding to evil with good (cf. Rom 12:17-21), and thereby breaking the chain of injustice”. 4. 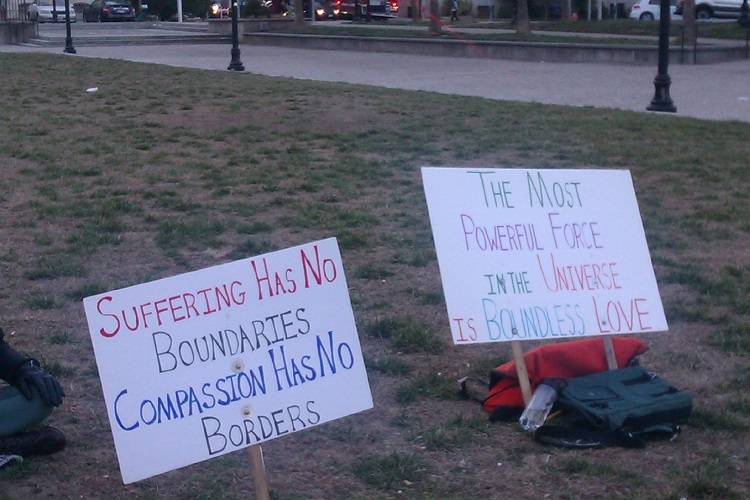 Nonviolence is sometimes taken to mean surrender, lack of involvement and passivity, but this is not the case. When Mother Teresa received the Nobel Peace Prize in 1979, she clearly stated her own message of active nonviolence: “We in our family don’t need bombs and guns, to destroy to bring peace – just get together, love one another… And we will be able to overcome all the evil that is in the world”. For the force of arms is deceptive. “While weapons traffickers do their work, there are poor peacemakers who give their lives to help one person, then another and another and another”; for such peacemakers, Mother Teresa is “a symbol, an icon of our times”. Last September, I had the great joy of proclaiming her a Saint. I praised her readiness to make herself available for everyone “through her welcome and defence of human life, those unborn and those abandoned and discarded… She bowed down before those who were spent, left to die on the side of the road, seeing in them their God-given dignity; she made her voice heard before the powers of this world, so that they might recognize their guilt for the crimes – the crimes! – of poverty they created”. In response, her mission – and she stands for thousands, even millions of persons – was to reach out to the suffering, with generous dedication, touching and binding up every wounded body, healing every broken life. 5. If violence has its source in the human heart, then it is fundamental that nonviolence be practised before all else within families. This is part of that joy of love which I described last March in my Exhortation Amoris Laetitia, in the wake of two years of reflection by the Church on marriage and the family. The family is the indispensable crucible in which spouses, parents and children, brothers and sisters, learn to communicate and to show generous concern for one another, and in which frictions and even conflicts have to be resolved not by force but by dialogue, respect, concern for the good of the other, mercy and forgiveness. From within families, the joy of love spills out into the world and radiates to the whole of society. An ethics of fraternity and peaceful coexistence between individuals and among peoples cannot be based on the logic of fear, violence and closed-mindedness, but on responsibility, respect and sincere dialogue. Hence, I plead for disarmament and for the prohibition and abolition of nuclear weapons: nuclear deterrence and the threat of mutual assured destruction are incapable of grounding such an ethics. I plead with equal urgency for an end to domestic violence and to the abuse of women and children. On January 20, the military officer carrying the nuclear codes who follows the President everywhere, will follow Barack Obama to the inaugural platform. When he leaves, the officer will start following President Donald J. Trump. From that moment on, Trump will have the unfettered ability to launch one or one thousand nuclear warheads whenever he pleases. Four minutes after he gives the order, the missiles will fly. No one can stop him, short of a full-scale mutiny. Once launched, the missiles cannot be recalled. Note: Below is the text of an leaflet that was distributed at the Fleet Week Baltimore Welcome Ceremony, at Baltimore’s inner harbor, on October 12. 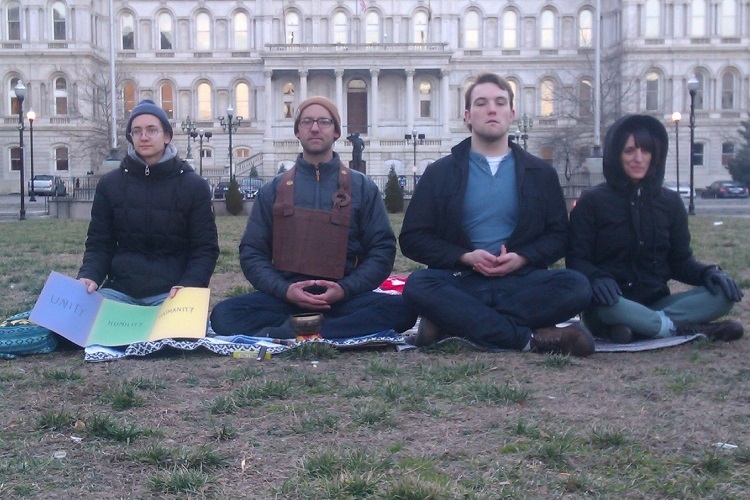 Jonah House and Pledge of Resistance – Baltimore organized a peace vigil to counter the celebration of war that is fleet week. On October 15, during Fleet Week, Baltimore has the dishonor of being the site where the new stealth destroyer, the USS Zumwalt, will be commissioned. It is a dishonor because the Zumwalt is a boondoggle of the grossest proportions and as such is a massive theft of the U.S. taxpayer and, in particular, the poor. It will also undermine true security in the United States. When research and development is taken into consideration, the price tag for the Zumwalt is nearly 6 billion dollars. This is obscene given the needs of the people of the United States, from health care to education to basic infrastructure repair. Originally the Zumwalt was to be the first of 32 new stealth destroyers, but because this new line had ballooned in cost—81 percent above the Navy’s original cost estimate to Congress—the Zumwalt line was reduced to only three ships. At six billion dollars each, this is still three ships too many. Martin Luther King once said that “a nation that continues year after year to spend more money on military defense than on programs of social uplift is approaching spiritual death.” If we are not already there, the Zumwalt brings us perilously close to spiritual death. But the Zumwalt is not only an obscenity in spiritual terms. As President Dwight D. Eisenhower put it: “Every gun that is made, every warship launched, every rocket fired, signifies in the final sense a theft from those who hunger and are not fed, those who are cold and are not clothed.” In moral terms, the Zumwalt is an outrage; in fiscal terms, it is indefensible. Baltimore is a poor city, plagued by the social ills caused by poverty, such as unemployment, homelessness, drug addiction, the drug trade, and the horrendous violence that comes with it. Six billion dollars would do much to alleviate the poverty of Baltimore. Six billion dollars would buy 50,000 homes. It would pay the yearly energy costs for 1.2 million households. It would buy all the groceries in a year for 1.5 million families. It would pay a year’s worth of health care premiums for 333,000 families. It would pay for the education of 400,000 students in Baltimore’s schools. It should also be noted that the Zumwalt will also be exorbitantly wasteful in terms of its fuel use. When fully operational, it will take 78 megawatts to power the ship. That’s enough to power 80,000 homes. And, unlike a nuclear-powered ship, the Zumwalt will run on carbon-based fuel. That will lead to a lot of carbon pollution, the leading cause of global warming. The U.S. military is already the biggest single emitter of carbon pollution in the world. Ships like the Zumwalt will make things much worse. But it isn’t just a matter of paying bills or carbon emissions. 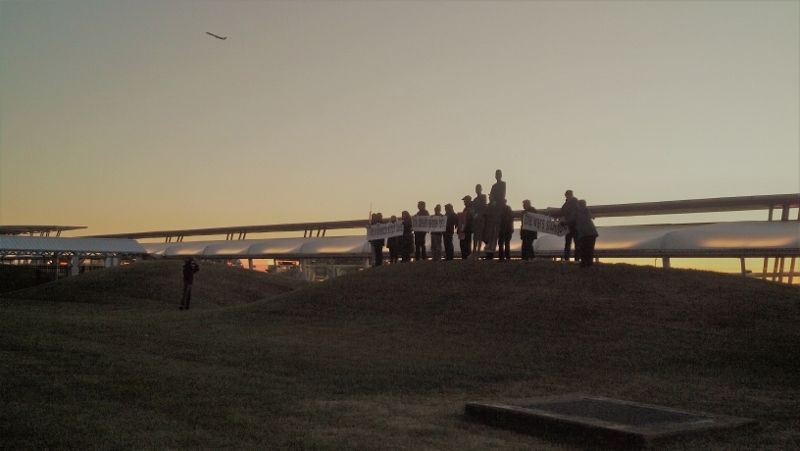 The six billion dollar Zumwalt is not only a criminal misappropriation of U.S. taxpayer money and a major polluter, it is also a betrayal of our true security needs. In our world today, more weapons will not make us safer. In fact, the more we spend on weapon systems, and the more we deploy them in conflicts across the world, the more we create enemies who resent us for our military aggression. 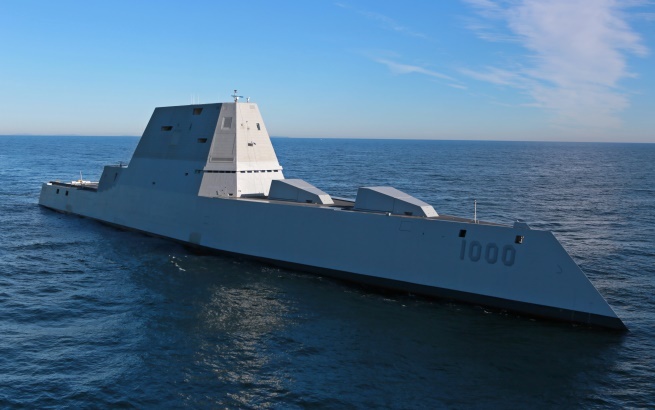 The United States would do better to use the six billion dollars it takes to build a Zumwalt to provide humanitarian aid for the victims of war. The motto of the Zumwalt is “Peace through power.” It is a truism that power corrupts. The only peace that power offers is a corrupt peace. It is a peace that enforces the status quo, and endorses an ideology that profits the rich and powerful at the expense of the poor and powerless. It is a peace that says “Might makes Right.” The false prophet says peace, peace, when there is no peace. The true prophet knows peace can be never be imposed by military power. The stealth ship called the Zumwalt represents a peace that is a stealthy form of war. It will inevitably be used to wage war on other countries, and is already inflicting suffering on the poor of Baltimore and the rest of the United States. I live, work, and play at Jonah House: An intentional peacemaking community founded by Phil Berrigan and Liz McAlister and a few others, who, motivated by faith, believed that it was their moral responsibility to resist every incarnation of violence and oppression. 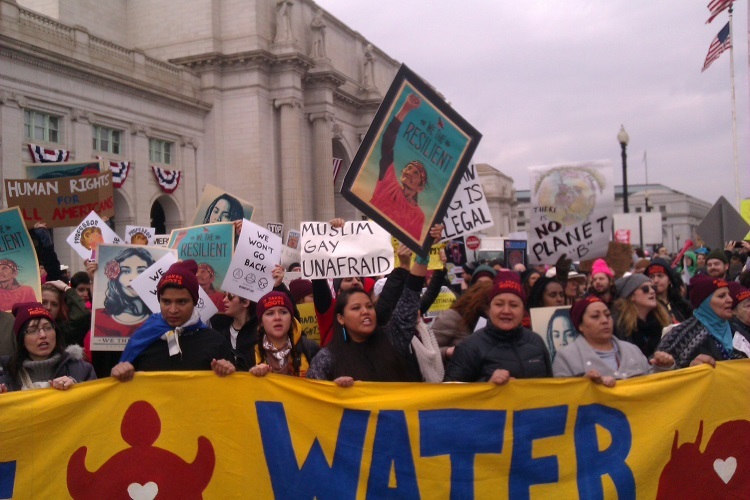 Their resistance often meant risking arrest, putting their lives and their bodies on the line for the sake of bearing witness to equality and justice, love and the way of nonviolence. As I reflect on the question we’ve been asked to consider — particularly in terms of Dr. Pargament’s point about exploring new domains for therapeutic interventions outside traditional clinical contexts — I do so from this rather radical — and by radical I mean root, or original — tradition of peacemaking. In discussing underserved communities, I think it’s important to begin by examining how we understand economic and social disparities. 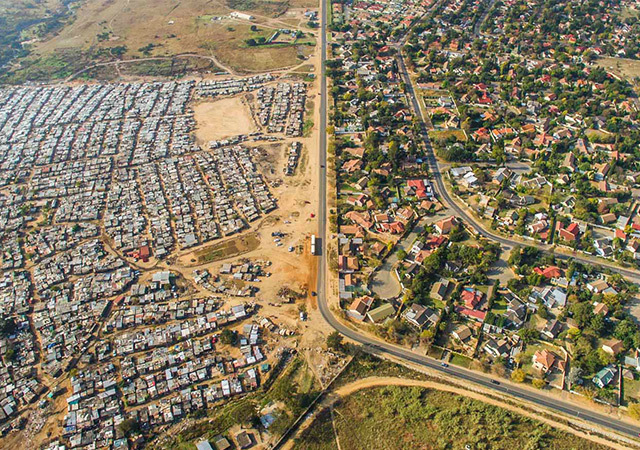 I would like to suggest that the pervasiveness of poverty, in all its forms, is not a failure of our systems, but a reflection of their proper functioning. In other words, underserved communities are a necessary consequence of social systems intended to advance, preserve and secure access to wealth and well-being based on certain identities like race, in particular whiteness, as well as educational background, social class and capital, profession, geography, gender, sexuality, and language. To name only a few. As spiritually-integrated helping professionals, I believe we uniquely experience a moral imperative to resist these and other injustices and to accept the risks of doing so. But what are we willing to risk to transform the systems and institutions that perpetuate and preserve structural disparities? 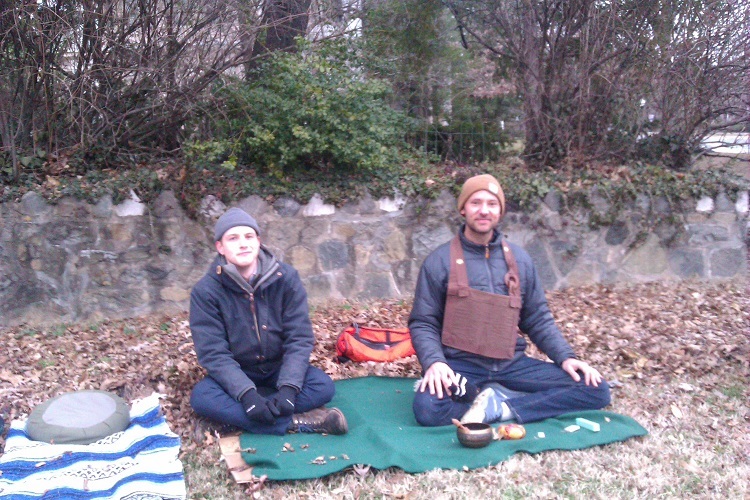 And if we believe that, as a principle of pastoral counseling and as Dr. Pargament pointed out, the therapeutic relationship initiates a spiritual dimension, what would it mean for us to hold and participate in this sacred space, especially in our work with underserved communities and clients, outside the clinical context? My decision to join Jonah House grew out of my personal and professional struggle to address these questions. As I worked with clients from underserved communities, first in Baltimore and then in New Mexico and Oregon, I was confronted with the matter of my moral responsibility to help change the injustices that necesitated their poverty, whether material, emotional, or educational. I came to the conclusion that an individual therapeutic relationship, for me, wasn’t sufficient. That I was called to another way. 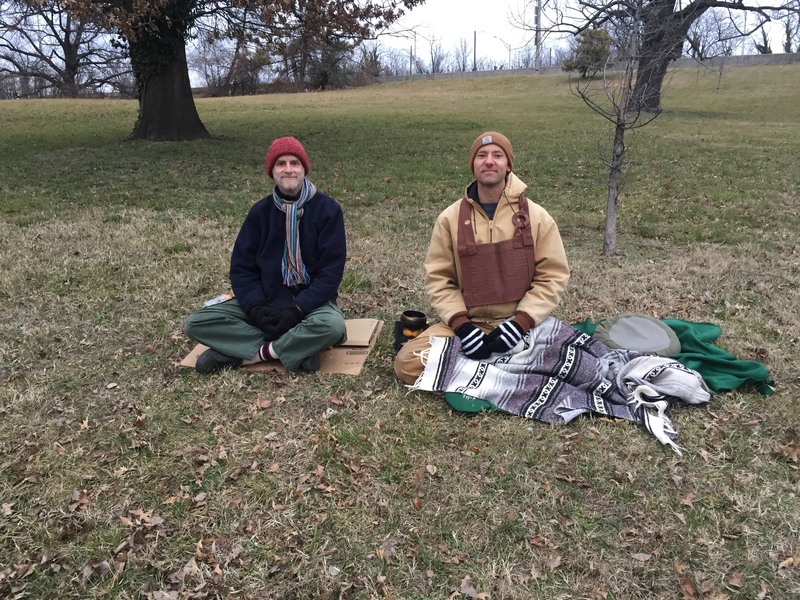 At Jonah House we care for a once-neglected 22 acre cemetery, 8 acres of which is a forest patch that offers beautiful greenspace in an otherwise treeless neighborhood withering from violence, addiction, and other symptoms of structural inequality. 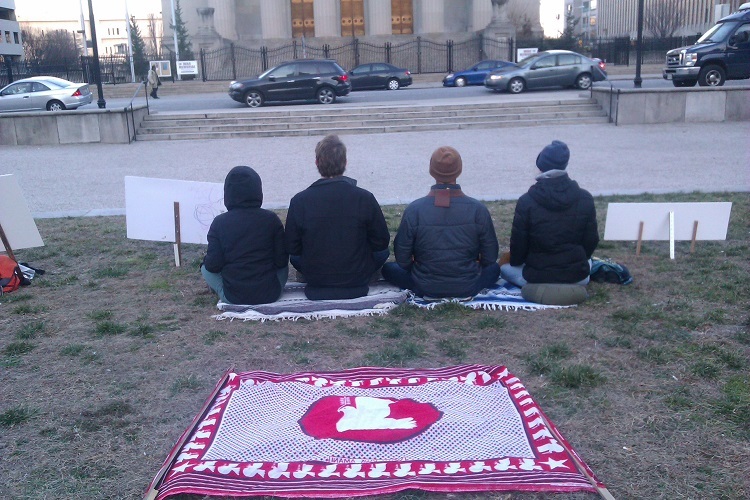 We run a food pantry, host student groups, and organize social justice actions in the city and elsewhere. In all that we do, though we fall short of the mark, we try to co-create a healing presence and kindle the spiritual dimension that’s the heart, body and wisdom of therapeutic encounter. I’m not suggesting that the life I lead is an exemplar everyone should follow to realize transformative social change. And I will add that I’m still, and always will be, considerably more privileged than my neighbors in West Baltimore — in spite of my good intentions to live in solidarity with them. The risks I take are choices and theirs are not. But I do believe, to paraphrase the Jesuit Dean Brackley, that by resisting a world obsessed with wealth, security, upward mobility and prestige, I’m able to see more clearly how that world — its values and the disparities these values necessitate — engenders and preserves underserved communities and the kinds of struggles they suffer with daily. This clarity invites me to live differently. And it’s a constant challenge, particularly to my privilege and the ways I benefit from systems intended to reinforce whiteness, maleness, and formal education. The challenge comes to me as a question, like a koan, whenever I interact with others in my community: What might I risk so that you don’t have to live at risk every moment of your life? I leave you with that question to consider.